Vanguard has a solid reputation for bags and cases, and despite being a few years old this hard case still holds up as an excellent buy. Vanguard describes the Supreme 46D as ‘virtually indestructible’, and frankly we believe it. The plastic outer shell is extremely resilient, surviving our world-renowned scientific testing procedure of jumping up and down on it. The Vanguard Supreme 46D is also built to survive changes in air pressure. A clever valve system at the front of the case lets air out if it detects pressure becoming too high, but also prevents air from getting in. This makes it an excellent prospect for frequent fliers. Seals around the edges also prevent ingress of water and six clamps around the outside ensure things stay shut. Measuring 51.5cm (w) x 43.5 (h) x 22cm (d) and weighing 7.2kg, the size of the Supreme 46D is generous enough for a few camera bodies as well as an assortment of lenses and flashguns. The Calumet WT6840 Watertight Rolling hard case measures 86cm (w) x 56cm (h) x 33cm (d) and is around one-third bigger than the WT3434 (top right). There is room to transport a three-head lighting kit with shapers, stands and triggers or several wide-aperture telephoto sports lenses. The case weighs 11.3kg and has a diced foam insert, but the optional adjustable divider padded inserts may be more suitable for large items. 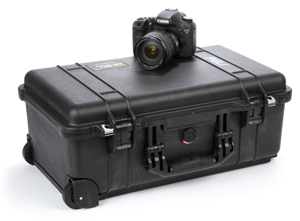 The substantial retractable handle and wheels are essential features, because when fully loaded with gear this case would require two people to lift it. I’m in favour of storing equipment in hard cases, even if it doesn’t leave the house very often, for the protection, security and organisational qualities such cases provide. This is a large hard case from Calumet’s own-label range. 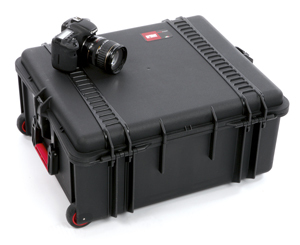 Weighing 7.7kg when empty with external dimensions of 65cm (w) x 51cm (h) x 24cm (d), it is substantial enough to hold a comprehensive DSLR kit with all the lenses, filters and chargers you need. 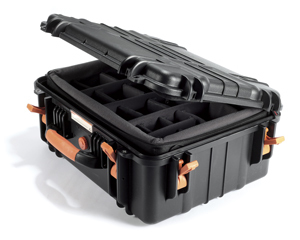 This case has a raft of features, including a watertight O-ring seal, internal pressure-release valve and pre-cut diced-foam inserts with the addition of a second lifting handle that is a handy feature. In terms of build quality, there is nothing to suggest that it wouldn’t last and protect delicate equipment in anything other than an exemplary way. Calumet’s reputation as a government and military supplier is reassuring. If I were to be brutally honest, it doesn’t have the finish or glamour of a Peli case, but for its size it is excellent value. Calumet cases stack well together, with even different sized models taking up minimum space when packed. With all the structural integrity of its smaller sibling (left), the Peli 1510 is a wheeled case of the maximum size permitted as carry-on hand baggage for most airlines, measuring 35.1cm (w) x 55.9cm (l) x 22.9cm (d). Our review sample was equipped with padded dividers inside rather than cut foam, and this is sometimes preferred as it is more versatile and can be adapted to kit changes. There is space for all the camera bodies, lenses and accessories you would need for a substantial assignment. When fully loaded with kit, this is a heavy item (weighing 6.17kg with foam), and the rugged wheels and extendable handle are essential features. 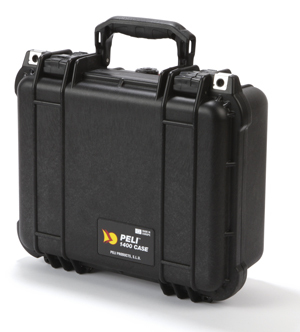 Although Peli Cases are designed to give ultimate protection in the hold, it is reassuring to have the option of your valuable kit close to hand when you’re travelling. The HPRC 2700W is an Italian-designed and manufactured hard case that has eye-catching red detailing to the carry and extendable handles. Weighing 7.55kg, it is made from a patented resin plastic that reduces the weight by 20%. The specifications of 62cm (w) x 52cm (h) x 27.5cm (d) and performance criteria compare favourably with the other brands in this test, with durability of the extendable handle being our only concern. 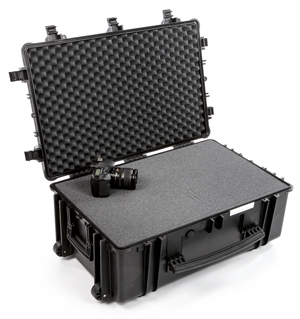 In terms of styling, the HPRC 2700W is similar to the Peli cases and if strength-to-weight ratio is your prime concern then this case is worth considering. 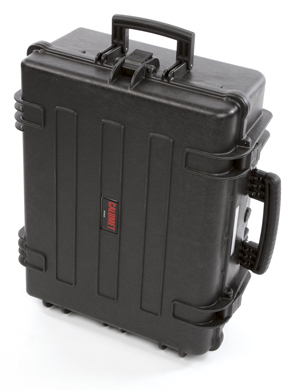 Peli has been at the forefront of protective cases for more than 30 years. Made of ultra-high-impact structural copolymer polypropylene, Peli cases can withstand virtually any kind of abuse, while a neoprene O-ring seal ensures they are certified for submersion in 1m of water for up to 30mins. 2kg with foam, and would accommodate a DSLR and extra lens but not much more. I like the ‘pick and pluck’ cut-foam interior, which is simple to adapt to fit your kit, while the double-throw latches are easy to open and close, sealing perfectly. The padlock-fitting holes are stainless-steel lined giving an extra level of security, and the carrying handle is very comfortable in extended use. This is a premium product that is exquisitely designed.